Warehouse Management Systems (WMS), Stock control systems and inventory management software all perform the same essential function in the stock management cycle, to inform the end user of the storage history of a pallet or product in the warehouse. Why is WMS so important? An effective warehouse management system is an integral part of the warehouse operation. WMS allows for the documentation of a products life cycle while in your warehouse, tracking the initial receiving of a product, storage and movements of the product, and the despatch of the product whether it is part pallet despatch or a full pallet despatch. 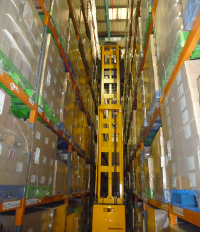 WMS also allows for the automation of picking lists, generated by a number of different picking methods, creating a faster and more efficient picking route for your warehouse operatives, by informing them require stock quantities, product locations and required despatch dates, thus increasing picking speeds. Increased Accuracy due to less scope for human error in the updating of stock records. Increased Efficiency as a result of automation of processes such as stock updates and stock documentation by the WMS. Real-time data with the automatic updating of inventory levels and stock locations through Goods In, Goods Out and Stock Moves. Usage insight system generated reports are able to report on both warehouse and employee performance. Essentially due to the nature of a dedicated warehouse management system over a manual recording system, a WMS system is able to improve stock accuracy, maximise storage usage and reduce picking time, benefiting both you and your customers. FeaturesWhat features does our WMS offer? Will my current computer system run WITS? PC's that run Windows XP or higher will run WITS. However we will make sure that system can support WITS during the intial proposal.